La nouvelle Casuarina Suite de l’Anse Chastanet, Ste Lucie vous offre une piscine de 15 m2 entourée d’une terrasse de 12 m2 avec sa vue stupéfiante aux Pitons chi s’élèvent de la mer. Avec beaucoup d’attention aux détails Casuarina a été aménagée des carreaux de pierre corallienne et de meubles faits main des bois tropicaux produit de manière durable. Située au flanc de la colline, au milieu d’une végétation tropicale, riche en fleurs avec une vue magnifique ! – La chambre spacieuse avec un dressing room s’ouvre vers un patio et salon de 40 m2 en partie sans murs. La grande salle de bain, également avec vue Piton, dispose d’une douche couple, une pour « Madame » et une pour « Monsieur » . Pour des réservations nous vous remercions de nous appeler au ou de nous envoyer un e-mail à ansechastanet@ansechastanet.com. Soufriere, Saint Lucia, May 15, 2014 — Anse Chastanet and sister resort Jade Mountain may not only be two of the most panoramic Caribbean resorts but possibly also the “sweetest”! There are over 1000 cocoa trees on the resort estates, including on the organic farm Emerald’s in the Soufriere Hills. For the past 3 years, the estate has hand-crafted Emerald Estate Chocolate for the enjoyment of the resort guests and with the opening of its chocolate laboratory, guests are now able to not only taste but participate in the making of the chocolate. Resort guests staying at Anse Chastanet and at the adjoining sister property Jade Mountain can now choose from a variety of chocolate infused activities like chocolate sensory tastings, educational estate trips and truffle making classes on a year round basis. Chocolate lovers will be further enticed by chocolate inspired dishes, cocktails and body treatments in the resort restaurants, bars and spa. And for the ultimate chocolate fest, visit Anse Chastanet and Jade Mountain during their annual Discover Chocolate Festival from October 10-14, 2014. Discover Chocolate: Taking the Chocolate Sensory Tasting a step further, guests participate in the actual making of chocolate in the Chocolate Lab. Guests learn the basic techniques of making chocolate, tempering chocolate ,creating their own fudge and making personalized chocolate bar. Tuesday from 10:30 – 11:30 am in the Chocolate Lab. $45 per person; Minimum 2, maximum 6 persons per session. The Emerald Estate Tree to Bar Tour: Guests will visit the Emerald Estate for a Cocoa Tour to experience the complete cycle of “Tree to Bar” production, learning about the history of chocolate in the Caribbean and the production process. At Emerald Estate, guests will first witness the natural side of cocoa including tasting raw cacao while discussing the fermentation, sun drying and polishing of the beans. Then they will return to the Chocolate Lab, where the host will elaborate on the technical part of making the perfect chocolate bar. This 2 hour guided experience takes guests through cocoa bean roasting, grinding and conching in the making of chocolate to create the perfect snap and shine. Along the way, guests will enjoy an invigorating cup of local cocoa tea and the Emerald Estate’s organic chocolate bars that range from 60 %, 70 % and 92 % Bittersweet. Guests will receive a Bar of Emerald Estate Organic Chocolate as the farewell souvenir to take home. Monday from 9:00 – 11:00 am, $75 per person. Minimum 2, maximum 6 persons per session. Saint Lucia celebrates Month of Chocolate this August! 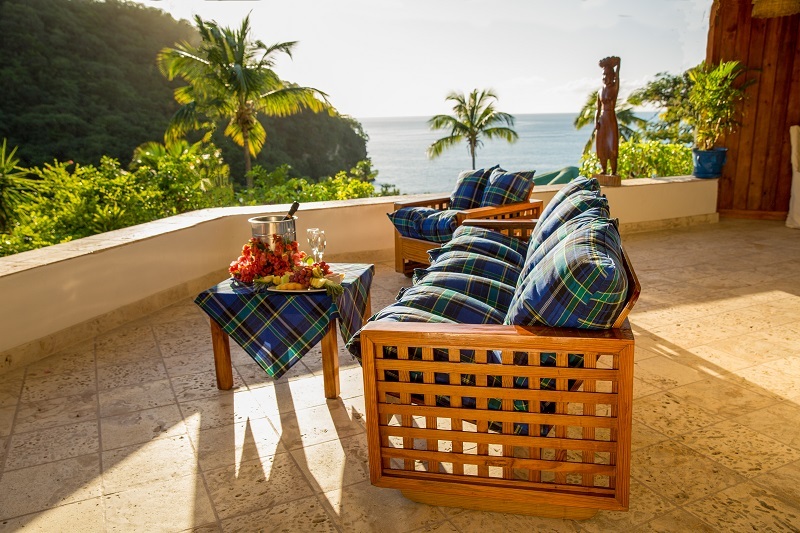 Take advantage of Anse Chastanet’s 4th and 7th night free promotions this summer. Then- literally!- sweeten the deal by adding the Dan Dous package to your reservation, to indulge in the resort’s chocolate offerings: Included are a chocolate welcome culinary amenity and cocktail, a chocolate infused 1 hour spa treatment per person, a chocolate sensory tasting of the resort’s own organically grown and locally made chocolates and a visit to the resort’s organic farm Emerald in the Soufriere hills. The Dan Dous package (Dan Dous is “sweet toot ” in creole patois) is based on a minimum 4 night stay and includes airport transfers as well as breakfast and dinner. The package is available in categories standard, superior and beachside deluxe. A 4 night stay on basis of the Dan Dous Package starts at US 1163 per person or US 2326 per couple in standard accommodation. The package is valid for Travel July 15- Oct 31, 2014- book by August 31, 2014. Restrictions may apply. Tranquility, Romance, Adventure: ANSE CHASTANET is one of the Caribbean’s most panoramic resort hideaways. Nestled amidst a 600 acre estate with two soft sand beaches bordering pristine coral reefs, ANSE CHASTANET offers excellent diving facilities and soft adventure activities. Rising majestically above sister property Anse Chastanet’s 600 acre estate with 2 beaches, JADE MOUNTAIN is an architectural marvel celebrating Saint Lucia’s stunning scenic beauty. The 24 open -walled sanctuaries are grand sweeping spaces each with an extravagantly sized private infinity pool floating out into nature and to amazing views. Enjoy fine dining options plus an entirely vegetarian restaurant using produce from the resorts’ organic farm Emerald’s. Resort activities include yoga, daily escorted walking or hiking tours, jungle biking on 12 miles of private trails, watersports with an excellent snorkeling and scuba diving centre. At the resort spas, a wide range of treatments are available including aromatherapy, ayurveda, and couples treatments and of course, chocolate infused spa treatments. Cocoa history on Saint Lucia dates back to the early 1700’s. There are many plantations on the island that have been harvesting and producing cocoa for many years supplying the local market and culture as well as becoming a part of the international commodity of Cocoa. In celebration, the month of August has been declared the “Month of Chocolate”. Both Jade Mountain and its sister property Anse Chastanet have been named one the world’s top Caribbean hotels by Condé Nast Traveler and Travel + Leisure. March 10, 2014: The beautiful Anse Mamin plantation belonging to the 600 acre estate of Saint Lucia sister resorts Anse Chastanet & Jade Mountain was featured in the final episode of ABC’s hit primetime reality series The Bachelor. The episode aired Monday, March 10th, 2014, at 8/7c on ABC. The stunning serenity and beauty of the Anse Mamin plantation is the perfect spot for the Bachelor’s romantic finale. Anse Mamin is part of the private 600 acre estate encompassing Anse Chastanet & Jade Mountain, a secluded beach and lush tropical Garden of Eden with historic remains of an 18th century plantation including a 1.5 Million gallon water reservoir and ancient waterwheel. Guests staying at Anse Chastanet and Jade Mountain can enjoy romantic walks through the plantation, go birdwatching or jungle biking. The Anse Mamin beach is a popular choice for the ultimate private Castaway dinner whatever special occasion is being celebrated. Soaring majestically above the exclusive 600-acre beachfront estate, Jade Mountain is an architectural marvel that embraces and celebrates St. Lucia’s stunning scenic beauty. Built in harmony with nature, Anse Chastanet is Saint Lucia’s classic hideaway resort providing guests with an authentic Caribbean experience. – Visit the picture gallery featuring Anse Mamin. – Learn more about Jade Mountain. – Learn more about Anse Chastanet. Visit the promotions page at Anse Chastanet and Jade Mountain for all details. February 25, 2014, Soufriere, Saint Lucia…The Bachelor has been lured, once again, to the irresistible enchantment of Saint Lucia. Saint Lucia Resorts Anse Chastanet and Jade Mountain will be featured as the cast and crew travel to the island for the final two episodes of The Bachelor. The newest Bachelor, Juan Pablo Galavis, comes one step closer to potentially completing his family. The episode is scheduled to air Tuesday, February 25, 2014, at 8/7c on ABC. And, don’t miss the March 10 final to see the location of the final Red Rose Proposal and of course, to find out who will be the Bachelor’s chosen one ! Airlines servicing Saint Lucia from the U.S.A. and Canada are Jetblue with a non-stop flight from JFK daily, United Airlines from Newark, American Airlines from Miami, Delta from Atlanta, Air Canada and West Jet from Toronto. For reservations call 1- 800-223-1108 or contact ANSE CHASTANET and JADE MOUNTAIN at Tel 758-459-6100 Fax 758-459-7700 e-mail ansechastanet@ansechastanet.com. On ABC’s hit primetime reality series The Bachelor, one lucky man is offered the chance to find true love. A single and eligible Bachelor embarks on a romantic journey, getting to know a number of beautiful women, gradually narrowing the field as he continues his search for his soul mate. At the end of this romantic voyage, if he has found the one, will there be a proposal – and will she say yes? Hosted by Chris Harrison, The Bachelor is produced by Next Entertainment in association with Warner Horizon Television. The 18th season of The Bachelor airs Mondays 8/7c on ABC. For more information on The Bachelor, visithttp://abc.go.com/shows/the-bachelor. Soufriere, July 3 : Owners, management and the Anse Chastanet resort team were overjoyed when the news broke that Anse Chastanet ranked No. 2 on the Travel + Leisure 2013 World’s Best Awards list of Top Resorts in the Caribbean, Bermuda, and the Bahamas. The resort also earned a place on the World’s Top 100 Hotels round up. Anse Chastanet’s sister resort Jade Mountain captured the coveted No 1 place of the Top Resorts in the Caribbean, Bermuda, and the Bahamas. Travel and Leisure Magazine’s World’s Best Awards have been announced every July/August since 1995 and each year are eagerly awaited by the tourism industry. The World’s Best Awards are an annual reader survey rating destinations and travel providers. Readers are asked to judge characteristics such as hotel rooms & facilities, location, service, restaurants/food, overall value, to find “the hotels that deliver the most extraordinary experiences”. According to the magazine, the resulting list is not only a go-to hotel resource for travelers planning their next trip, but also reveals the destinations that are important now. This year, the magazine states, one of the most exciting trends is the desire to get off the grid. Anse Chastanet owners Nick and Karolin Troubetzkoy congratulated their resort teams for playing an integral part in having made this high ranking possible. “We are very grateful to work with resorts teams that so consistently deliver as can be seen by the many recognitions our resorts have enjoyed over the past years. You can set standards for a hotel operation, but the standards need to be carried out by a team that wholeheartedly embraces them and has the ambition to excel in everything they do. We do not only want to meet guest expectations, we want to exceed them every step of the way, and our teams share this philosophy”, says Karolin Troubetzkoy who is the Executive Director of Marketing and Operations. Daily rates at Anse Chastanet start at US 345 this summer. Rates are subject to 8% tax and 10% service charge. Summer promotions are available. For more information, call 1-800-223-1108 or email ansechastanet@ansechastanet.com. On October 16, Condé Nast Traveler unveiled the results of these annual Readers’ Choice Awards, now in its 25th year, ranking the best cities, islands, cruise lines, airlines, hotels, and resorts worldwide. A record number of 46,476 readers participated in the voting, rating 370 hotels, resorts, and cruise lines above a score of 90. In total, the readers elected 1,306 winners. 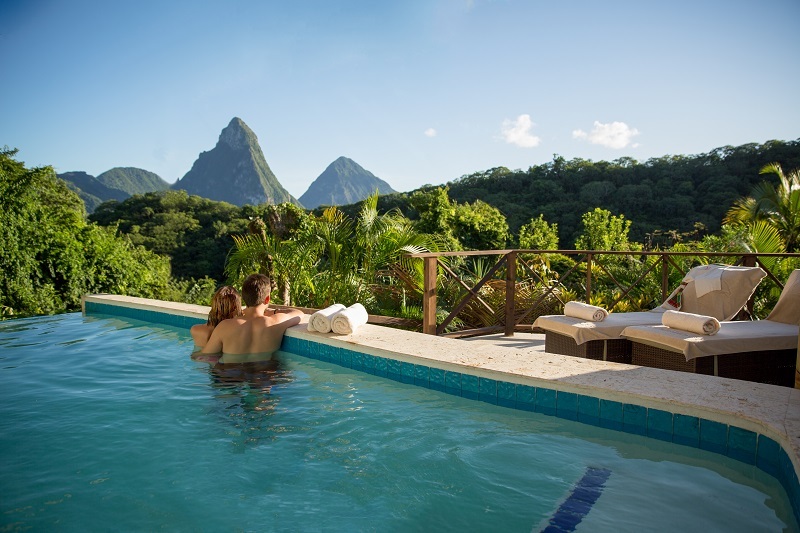 St.Lucia’s Anse Chastanet and Jade Mountain Resorts were voted to be among the TOP 3 Caribbean Resorts, on position 2 and 3 respectively with an overall score of 95.4 and 95.1 % missing out on the winning Number1 position by a mere 0.4%. The overall score is made up from individual ratings for the resorts’ rooms, service, food, location, design and activities. The high rating of the two resorts also ensured their inclusion in the TOP 100 Resorts worldwide. At Saint Lucia’s Anse Chastanet Resort, birdwatchers will delight in the many bird watching opportunities available on the resort’s 600 acre estate. In addition, Anse Chastanet now offers a 5-day activity package for birdwatchers including the most important off property birdwatching locations in response to the ever increasing interest in this particular aspect of ecotourism. The birdwatching activity package takes full advantage of the resort’s location on the southwest coast near the town of Soufriere and the world famous Pitons; as a UNESCO World Heritage Site, as the area is a notable attraction to eco-minded tourists from around the world. Package activities include excursions to other specific locations on island which are recognized for their outstanding natural beauty as well as being natural habitats of a great number of interesting and exotic bird species. The Birdwatching Package includes five days of specific excursion activities tailored to provide the best experiences available for guest birdwatching enthusiasts. Birding has become a very popular activity in Saint Lucia due to a large variety of interesting and attractive species on island. Much of this is because of the wide array of habitats the island features – dry coastal areas, lush rain forests, scrub forests, rugged sea cliffs, etc – and the resulting variety of foods that appeal to various species. Anse Chastanet’s Birdwatching Package excursion activities begin with a visit to the resort’s Anse Mamin Plantation, a historical estate which is part of the resort property. Trails within this lush coastal jungle with its 18th century plantation ruins are ideal for birding. The tour is designed for both novices and veteran birdwatchers and is an easy and pleasant introduction to birdwatching on the day after arrival. Included on day 2 is a visit to the Millet Bird Sanctuary for a leisurely two hour forest trail walk led by a Department of Forestry guide. Along the way over 30 species can be seen, including five endemic species: the St. Lucia Parrot, St. Lucia Black Finch, St. Lucia Warbler, St. Lucia Oriole and St. Lucia Pewee. takes you through one of the wettest tropical forests on earth receiving as much as 150-200 inches of rain annually. The St. Lucia Parrot is readily encountered along this trail. Stops at a wetland and two coastal sites along the way also afford enjoyable birding and sightseeing opportunities. For a bit more of a challenge, the package includes a hike to the top of Gros Piton, the higher of Saint Lucia’s two iconic mountains. As you set off you will encounter the rare birds and wildlife that find sanctuary in this rugged and somewhat remote part of the island. The St. Lucian Wren, St. Lucia Oriole, St. Lucia Black Finch and the Red Neck Pigeon are just some of the rare bird species that will add to your experience along the trail. To take in the beauty of the blue Caribbean, guests enjoy a morning of Dolphin & Whale Watching; sea birds are encountered along the way. Included in the package as well is a combo excursion that visits three of the island’s most popular attractions. Guests begin with a visit to the Diamond Falls & Botanical Gardens, an historic site which was created by France’s King Louis XIV with mineral baths built for his troops to take advantage of the recognized rejuvenating powers of the mineral rich volcanically heated spring water. Then it’s on to the Sulphur Springs volcano to relax in the mud baths and view this interesting geologic wonder. The morning’s activities finish at the Tet Paul Nature Trail, which features birdwatching opportunities as well as enjoying from up high the majestic beauty of the world’s most famous pair of mountains. Located in the midst of St. Lucia’s World Heritage site, great views of Gros Piton and Petit Piton, the island’s southern region and a panorama of the blue Caribbean are presented. Anse Chastanet’s Birdwatching Package also offers plenty of free time to fully enjoy resort’s two beaches and the myriad of other enjoyable activities featured at the resort. The 5 day birdwatching activities package can be added to any reservation at Anse Chastanet property and can be booked directly with the resort for US 695 per person for a minimum of 2 persons. All excursions are set up as private excursions. Heavy Coral Spawning activity on the Anse Chastanet Reef at St. Lucia’s Anse Chastanet Resort resembled a heavy snowstorm, say divers who witnessed this phenomenon. Soufriere, Sept 10: In what has become a highly anticipated annual event at the Anse Chastanet Resort, nature did not disappoint this year as an extremely dramatic coral spawning event was witnessed by night diving scuba divers staying at Anse Chastanet. Corals spawn by releasing millions of packets of egg and sperm cells that appear underwater as massive pink and white clouds that slowly drift to the surface where fertilization occurs. Based on experience at, it was predicted the main spawning events would occur on Thursday, September 6 and Friday, September 7. On Thursday, divers descended on the Anse Chastanet Reef waiting patiently for the spectacle to begin. Around 9:00 p.m., Brain and Elkhorn Corals began the spawning process with a modest release of the reproductive cells. Divers again went in the water on Friday evening. Illuminated by dive lights, the event commenced at 9:30 p.m. when Boulder Brain corals started releasing their reproductive cells. What followed, as other coral varieties joined in, was the most massive and spectacular spawning event anyone on hand had ever seen. While much about the coral spawning process remains a mystery, it is known that each species of coral on a reef synchronizes the timing of its spawning, which takes place only once each year. The key controlling factors are believed to be water temperature, the moon’s cycle, length of daylight hours and the tides. The development of the eggs and sperms are triggered by rising water temperatures during the summer leading to the spawning in late summer or early fall. Experience has determined the ideal time for the release of the reproductive cells is a week or so after a full moon when tides and currents are diminishing providing more hospitable conditions for the fertilization process. Also, spawning always begins an hour or two after sunset providing the cover of darkness as an additional advantage for survival. The advantage of this mass spawning process is to increase the chances of survival for the larvae. During spawning most will be eaten by fish and other sea organisms, but the huge numbers overwhelm the predators insuring that many will live to propagate the species. Because of this, Anse Chastanet divers who witnessed the spawning event were also treated to viewing schools of fish that appeared and resident crabs and lobsters that emerged from the reef to partake in the feeding frenzy. Each year Anse Chastanet publicizes the predicted date of the spawning to allow resort guests and others to make plans to be on hand for this enjoyable display. While divers at the resort witness the events on the Anse Chastanet Reef directly off the beach, it is assumed that the spawning events happened at the same time on other reefs around the island. Anyone interested in additional information on the coral spawning event can contact Scuba St. Lucia at the Anse Chastanet Resort. For general resort and St.Lucia diving visit the websites of Scuba St. Lucia and Anse Chastanet Resort. Alternatively email scuba@ansechastanet.com or call Tel 1-800-223-1108. July 6, 2012 : The prestigious Travel + Leisure magazine today announced the results of their 2012 World’s Best Awards Readers’ Survey of the World’s Top Hotels, Resorts, Cities, Islands, Cruise Lines, Airlines and more. A questionnaire developed by the editors of Travel + Leisure®, in association with ROI Research Inc., was made available to Travel +Leisure readers at tlworldsbest.com from December 1, 2011, to March 31, 2012. Readers were invited to participate through Travel + Leisure magazine (January, February, March, and April issues), T+L iPad® editions and newsletters, and online at TravelandLeisure.com. To protect the integrity of the data, after March 31, 2012, respondents were screened by Travel + Leisure and responses from any identified travel-industry professionals who completed the survey were eliminated from the final tally. The survey website, tlworldsbest.com, was maintained, monitored, and kept secure by ROI Research Inc., which collected and tabulated the responses and kept them confidential. For more information about the Travel + Leisure® 2012 World’s Best Awards Readers’ Survey, click here. Scuba St. Lucia, the PADi 5 Star dive operation at the Anse Chastanet Resort in Soufriere, was presented a loyalty award by PADI, the Professional Association of Diving Instructors, marking its 30th anniversary of the dive centre’s affiliation with PADI. The award was presented on Tuesday, April 10, by PADI’s Regional Manager, Mike Hill, in a brief ceremony held at Sandals Regency in conjunction with a PADI Forum being conducted for all of St. Lucia’s affiliated scuba diving operations. Receiving the award for Scuba St. Lucia were manager, Bernd Rac, and assistant manager, Callistus Jackson. The award cites “For 30 Years of Outstanding Service Member Since 1982”. PADI is the world’s largest scuba diving training organization which is affiliated with over 6,000 dive shops and resorts around the globe. Founded in 1966, PADI is recognized for setting industry standards for dive training for its modularized approached to teaching which combines theory with practical application. Anse Chastanet owner Nick Troubetzkoy founded Scuba St. Lucia in 1981, recognizing the great potential of the diving tourism market for Saint Lucia and taking advantage of Anse Chastanet’s location in the midst of numerous coral reefs which soon became recognized as offering some of the best diving and snorkeling in the region. The resort’s initiatives since the early 80’s to attend international dive shows and advertise in scuba diving magazines abroad soon put Saint Lucia on the top as a must see destination for scuba divers. Also, these early marketing activities undertaken by Anse Chastanet and Scuba St.Lucia created the foundation for other dive operations to eventually emerge on island, making scuba diving a viable segment of Saint Lucia’s tourism product. Scuba St. Lucia, for many years, was the principle operation to provide training and professional certification to Saint Lucian nationals to become dive instructors and dive masters. Also, Scuba St. Lucia played a key role in the development of the Soufriere Marine Management Association (SMMA) which oversees the sustainable management of Saint Lucia’s important marine resources along the island’s southwest coast. Experience total relaxation, utter tranquillity and discover the transformative power of yoga in paradise! This fall, the tropical hideaway of Anse Chastanet Resort in St Lucia will be hosting a very special yoga retreat week for guests, led by Californian yoga guru Ginger Tracy Olmscheid. Set on the beach sheltered by swaying palms and surrounded by the soft sound of the waves, the yoga pavilion at Anse Chastanet is an idyllic location in which to roll out your yoga mat, work on your warrior and BREATHE! Created with the beginner in mind, Ginger’s yoga retreat will offer a fun way to learn the fine art of being present and developing mindful breathing through your yoga practice. Ginger can also customise her tuition to cater to the most dedicated yogi or yogini too, so all levels of student are welcome. Ginger Tracy Olmscheid has been a yoga instructor, personal trainer and fitness teacher for 25 years, with additional certifications in holistic nutrition from Bauman College in Berkeley, California. Her wide base of training in various styles of yoga and fitness training enable her to customize her rejuvenating and restorative classes to awaken mind, body and spirit. Participants will enjoy two hour-long classes, a morning session and a late afternoon sunset session, each day for five of the seven days of the yoga break, with two rest days during the week. They will also receive a customised nutritional plan from Ginger, aiming to balance out their chakras and body energy. To book this retreat, please make your reservations via 1-800-223-1108 or contact Ginger through herwebsite. 7 nights Superior accommodation * breakfast * lunch * afternoon tea and dinner * all tax and service * airport transfers both ways * a welcome cocktail * manager’s rum punch party * mini-sailing * windsurfing * snorkelling * use of tennis court and tennis equipment * guided tour of Old French Colonial Plantation * basket of local fruit * use of beach chairs and beach towels. Advanced Flash Techniques in The Islands! Joe Mc Nally’s Hot Shoe Lighting Workshop returns to Saint Lucia! Photographers have an opportunity to learn lighting and camera techniques from one the world’s leading photographers and educators at St. Lucia’s ANSE CHASTANET and JADE MOUNTAIN Resorts from Sep 30 through Oct 6 2012. Joe McNally, internationally acclaimed American photographer and long-time photojournalist, will conduct an intensive week of small flash education, emphasizing advanced techniques. “There is no more beautiful place to shoot, and to learn about light,” says Joe McNally who has had a longstanding photographic love affair with the resorts. Classes will run from Oct 1 through Oct. 6 2012. If you have not yet gotten certified in the use of Nitrox Enriched Air, Anse Chastanet Resort in Saint Lucia offers scuba divers free completion of the course and free Nitrox in conjunction with a one week stay at the resort until Dec 19, 2012. To be eligible, sign up for the PADI eLearning Nitrox Course and complete the academic portion at home in your leisure time. Just go to the dive centre’s website and select ‘Courses’; scroll down the page and you will find the PADI eLearning icon to click on. This will allow you to register and complete the academic requirements on line and the dive centre will be notified by PADI. The cost of the course is US$195. Then, when you arrive with us at the resort you will complete the practical portion of the course at no additional cost and get Nitrox free for all of your dives during your stay. The resort special summer dive deal weekly package is available for US 1869 per certified diver in double occupancy. The dive deal package includes: 7 nights run of house accommodation, airport transfers, breakfast, lunch, afternoon tea and dinner, all tax/service, welcome drink and fruit basket on arrival, 12 beach or boat dives incl of tank, weights, belt, mask, snorkel, fins (other equipment at a charge if needed, marine park fee to be paid locally) comp non motorized watersports. A marine park fee of US 15 is to be paid locally. The package is available to certified divers. Please bring your certification cards with you. As you are aware certain medical conditions prevent you from diving. If you have any concerns, please address them prior to travel with your diving physician or contact our scuba shop at scuba@candw.lc. 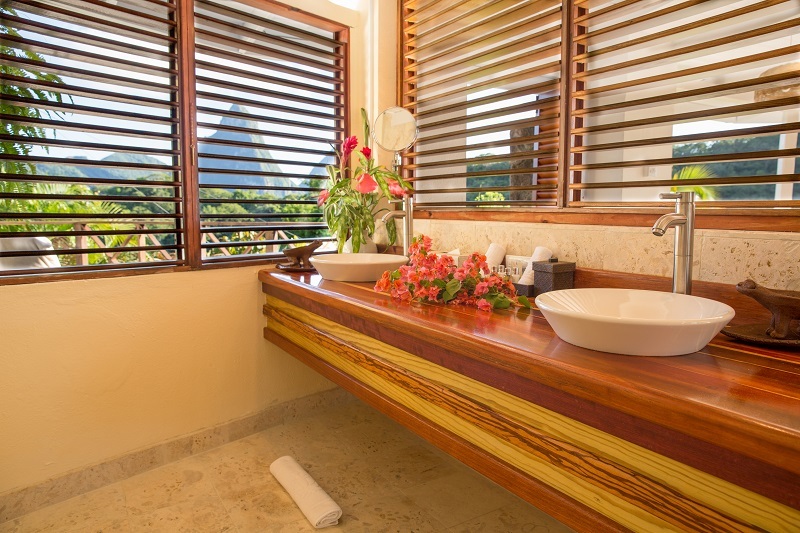 Lush, tropical ANSE CHASTANET is one of the Caribbean’s most scenic resort hideaways. Nestled amidst a 600 acre estate with two soft sand beaches bordering pristine coral reefs, ANSE CHASTANET is in complete harmony with its natural surroundings and right in the heart of the island’s marine reserves. The active will enjoy the resort’s amazing range of adventure facilities. Facilities include two restaurants & bars, the Kai Belté spa, mountain bike facility with 12 miles of trails, kayaking centre, 42 ft sailing yacht, boutiques, library and art gallery. The resort diving operation SCUBA ST.LUCIA caters to beginners and experienced divers alike Nitrox is available. Beach, boat, wall and wreck diving are all offered. The night dives right on the ANSE CHASTANET reef are a highlight for any diver. Look for THE THING !